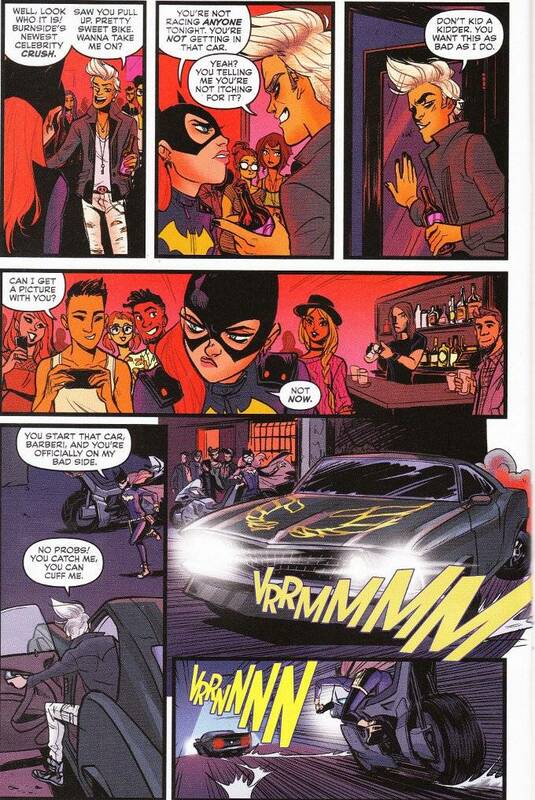 It isn't often that a comic manages to change my opinion of it in one issue but Batgirl #38 managed this task. Ironically, it did this by trying to defend its new direction on a metatextual level. It seems I was willing to forgive this title its flaws until it began pointing them out, like a nervous homeowner during a tour of their house. 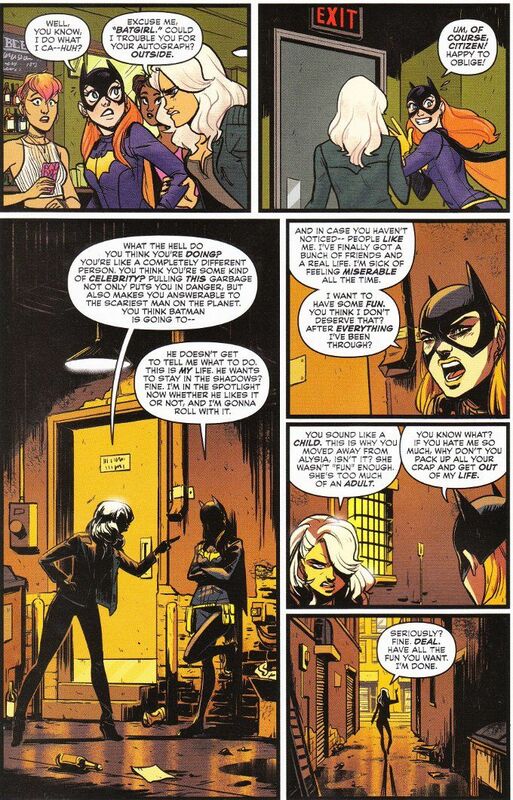 To cut that long story short, Dinah acts as a proxy for the critics of Batgirl's new direction. She points out that Babs is no longer the studious bookworm she once was and that Babs has apparently forgotten all about her former best friend and roommate, Alysia. Babs counters that there's nothing wrong with her wanting to have fun and enjoy herself after everything she's been through recently and tells Dinah to get out of her life if she's going to act like this. The hell of it is, Dinah is right. Babs IS acting childish and is totally out of character. And the rest of the issue showcases not only how Dinah is right about Barbara's changed personality but how the detractors of this title have been 100% right about everything else. This book is not about Barbara Gordon. The Barbara Gordon I know and love would never be as stupid and short-sighted as the heroine in this bat costume we see in this issue. With all the horrible things going on in Gotham, who does this Batgirl choose to focus on? Some rich douche-bag who - while a douche-bag who commits numerous petty crimes and then gets off because he's rich and famous - is ultimately less responsible for the destruction that occurs than Barbara. In the middle of this, I realized that while many detractors of this title have focused on Barbara abandoning the one friend she had during the Gail Simone run, nobody has made the same complaint about Barbara's love life. Whatever happened to Ricky Gutierrez - the ex street thug gone good Barbara began seeing during Simone's run? Apparently he's been abandoned for Officer Powell - a goody two-shoes cop who hates vigilantes like Barbara hates clowns. While I may grouse about the writing, I have no such complaints about the artwork of Babs Tarr. Her energetic style is a perfect complement to the story. I just wish she had better material to work with. The crazy thing is that there is a story I'd like to read in this comic but it isn't about Barbara Gordon learning a Very Important Lesson about popularity being fleeting and power needing to be used responsibly. I want to read a comic about Dinah Lance trying to rebuild her life and getting a gig singing for a rock band. And if Brenden Fletcher and Cameron Stewart ever elect to tell that story, I'll be the first in line for that book. As it is, I think I'm done with Batgirl for now. There are good stories to tell about a newbie heroine who learns from her mistakes and I wish Brenden Fletcher and Cameron Stewart would tell them. I just wish they used a heroine besides Barbara Gordon to do it.